How great would it be to have a crystal ball? Patient care would be totally revolutionized, heartbreak would fall to an all-time low, and client satisfaction and compliance would be off the charts. Perhaps there would be some unwanted consequences, but for the most part, being a veterinarian with a crystal ball would be a game changer. We know crystal balls aren’t in our immediate future (pun not intended), so business must carry on as usual. Clients will come in with their pets, diseases and injuries will continue to appear at various stages, at times too late, and treatment will be administered, sometimes leading to emergency care that can end tragically or triumphantly. As the experts in animal medicine, you know certain breeds, pets of specific sizes, and age, among other things, all play a factor in what a dog or cat may encounter medically in their life. You may see a young French bulldog and have a hunch they could develop a number of serious conditions as they age. A client may bring in their older cat and experience tells you kidney disease, urinary tract infections, or diabetes could be in their future. Or, maybe you warn a new pet owner their 60-lb. mixed-breed rescue dog could get into something they shouldn’t, leading to a serious bout of diarrhea and vomiting or worse. How could more certainty—or at least more evidence to support your hunches—change the conversation, compliance, and possible condition outcome? This is where claim data from a medical insurance provider for pets can complement your expertise and create a solid foundation for your instincts. Mary Rothlisberger, Trupanion’s credentialed actuarial scientist trained to understand the risks present in medical insurance for pets, along with her team, conducted in-depth research into hundreds of thousands of claims that made up the nearly $700 million in claims payouts over the past 18 years. This abundance of data allows for a robust understanding of breeds, trends in pet health conditions, and associated costs from across North America. More importantly, it can help veterinarians provide their clients with a highly tailored education. You’re already the trusted expert, but being able to tell a client their Frenchie is most likely to develop mast cell neoplasm when they’re around seven years or older helps inform your decisions, back your experience and education, and add fodder to the compliance fire. Claim data can’t beat a crystal ball in terms of precision and detail, but it can tell you and your client that dogs typically aren’t out of the woods in terms of foreign body ingestion until they’re much older. It can also tell you that although the average cost for treating a foreign body intercepted in the stomach may only be a couple hundred dollars, a linear object that progresses to the intestines averages $2,400 to treat. From there, if the foreign body ingestion leads to a septic infection, costs can dramatically increase, averaging something to the tune of $4,000 to treat. More than anything, this data can confirm that, unlike other issues that may be unique to a certain breed, foreign body ingestion is an incredibly common condition and a top driver of veterinary costs across all dog breeds and sizes. Armed with this data, a client is bound to keep a closer eye on their buddy and be more proactive about seeking treatment if they end up eating something they shouldn’t anyway. The same can be said for illnesses. A pet owner who knows from robust evidence their Cavalier King Charles spaniel is 10 times more likely than the average dog to develop syringomyelia would probably be much more willing to follow your advice of a proactive approach to treatment. 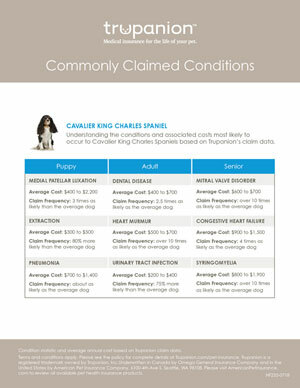 In fact, the research found more than 75 percent of claims for syringomyelia come from Cavaliers alone, indicating the condition is nearly exclusive to the breed. And cat owners who learn the prevalence of kidney disease in middle-aged cats, and the average cost to treat it (a whopping $1,400), will likely listen more closely when you describe the signs to look for in their feline friend to catch it early. It probably doesn’t come as a surprise to you (especially if you had a crystal ball), but it turns out breed size is one of the biggest determinants of potential health risks. For instance, the research found that 80 percent more claims for dental disease come from small dogs, while CCL ruptures, the number one driver of veterinary costs, is much more common in large-breed dogs, especially those between the ages of two and seven years old. 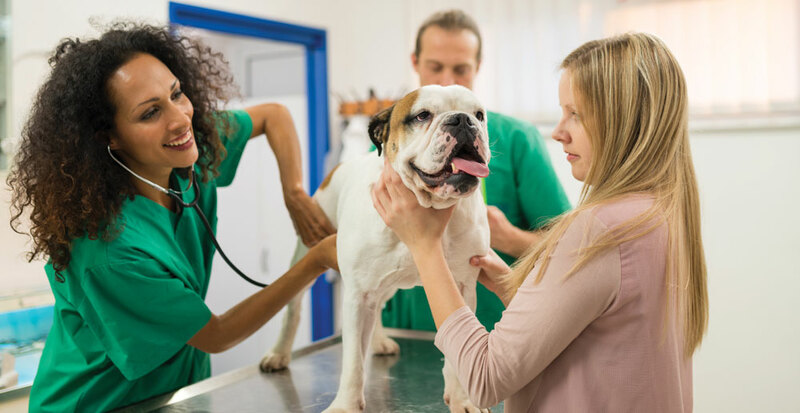 The veterinary profession is one of the most compassionate in the world, so it’s probably safe to say that most veterinary professionals entered their chosen career path to better the lives of their patients. After all, what’s better than saving a beloved furry friend and seeing them go home with their grateful family? Not much! With more information, more evidence, and more data comes more opportunity to customize your treatment plans and the education you give pet owners. It can help focus your treatment and maybe even encourage personalized medicine, leading to more happy endings for your patients, their families, and you and your team. All of this can be wrapped into the conversation of how pet owners will prepare for the unexpected, because the truth is, a lot of pet owners aren’t thinking that way. Everyone wants their pet to live a long, healthy life, but you know all too well that accidents happen and illnesses can come out of nowhere. You improve the lives of pets and their families with medicine every day, but you also have a unique opportunity to do so by simply asking how pet owners will prepare for the unknown. With claim data on your side, you can put specific numbers to your experienced hunches and hard evidence behind your trusted recommendations. It may be awhile before a crystal ball revolutionizes the veterinary profession. In the meantime, claim data can start to clear the fog of the unknown. To learn more, watch Trupanion’s free CE webinar, “By the Numbers: Examining Top Health Risks for Dogs and Cats,” and download the booklet with claim data for popular dog breeds and cats.